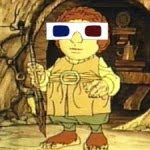 In response to the recent 3-D craze (thanks to James Cameron and his upcoming Avatar film) there have been rumors that the Hobbit films could be in 3-D. The overwhelming reaction from Tolkien fans was "No thank you!" Oct. 2010 UPDATE: Reports are now saying that both films will be shot in 3D. Who will play Bilbo Baggins? Will the real Gollum please stand up? The Hobbit is (slowly) getting closer!